This note depressed me. But quite frankly, it did not surprise me. The math program in our public school—a Canadianized version of the reform math so reviled in the US—continually frustrates and confuses my twin daughters, both of whom are A students in math. Both of them have declared, on many, many occasions during the past three or four years of struggling through this program, that they hate math. This really depresses me, because my husband and I have gone to great lengths to instill in our girls a love of math, a sense that it can be interesting and fun and challenging, and that, contrary to the message they may be receiving from the culture in general, it is something about which girls and boys should be equally enthusiastic. Before I go any further, let me state a few facts about myself. Yes, I dislike reform math or "fuzzy" math or constructivist math, or whatever you want to call it. But . . . I am not an educational conservative, a back to basics advocate, or a nostalgic drill-and-kill enthusiast. On the contrary, I am a firm believer in progressive, child-friendly public schooling for all. I feel I have to say this because the "math wars" have been so politicized, both in the US and here in Canada (where in true Canadian style, the "war" was more of a minor skirmish followed by complete capitulation), that anyone who opposes the current math curriculum is branded as educationally retrograde. I think in order for an intellectually honest and productive discussion of math education to occur, this politicization and presumptive name-calling has to stop. So why do I object to constructivist math? One reason is that it is, by-design, non-incremental or "spiral": its textbooks jump around from topic to topic, never staying on a subject long enough to allow for deep understanding or competence. I also dislike reform math because it frowns upon direct instruction. Since constructivist math teachers believe children can "construct" or "discover" mathematical truths and come up with their own algorithms to solve problems, they offer students minimal guidance, and are not averse to putting the cart before the horse: e.g., assigning algebra-type problems before teaching the tools of algebra, or asking kids to divide or multiply by decimals or fractions without having first taught them how decimals and fractions work. All of this—the bouncing around from topic to topic, the "challenging" problems, the lack of direct teaching—constructivists defend in the name of what they call "conceptual" learning, which they oppose to both abstract instruction and their favourite straw man, "drill-and-kill" work. But there are two problems with this normative use of the term "conceptual." First of all, "conceptual" and "abstract" constitute a false binary opposition: a concept can be abstract, and an abstraction is not necessarily unconceptual. Take the standard algorithm for long division. Because this method of performing division—like all mathematical algorithms—can be separated from concrete or specific division problems, it is deemed to be abstract. Proponents of constructivist math argue that presenting it upfront would be tantamount to teaching division in a manner that does not allow kids to understand the concept behind it or why and how it works. But a mathematician (and it's interesting to me that most of the authors of constructivist math textbooks are not mathematicians) might counter that the algorithm embodies the concept—otherwise it would not work. So, let's say a teacher were to demonstrate the standard algorithm for long division at the outset of a lesson; he or she could, conceivably, set aside class time for practice and mastery, and then—with student participation—pick apart the algorithm to find out how and why it works. Would this be less conceptual than making kids stumble through division problems on their own, hoping they will discover an efficient algorithm, which most of them will never do? Secondly, even if the terms conceptual and abstract were in fact polar opposites, why would we favour one over the other? 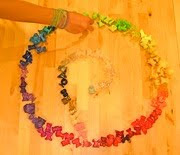 There are some kids who love working in groups or with concrete materials (methods favoured by constructivists) but there are others, like both my daughters, who simply enjoy playing with symbols on a page, and who find all the illustrations, and colourful doodads in their current textbook patronizing and distracting. Why do we assume that math instruction must be a one size-fits-all proposition? But my real opposition to the privileging of the conceptual in constructivist math is that it is misleading and even hypocritical: in my experience, constructivist textbooks do not encourage conceptual understanding at all. Indeed, my main problem with reform math is that it does not promote mathematical understanding, full stop. When you convert an area in metres squared to centimtres squared, each dimension is multiplied by 100. So, the area is multiplied by 100 x 100, or 10,000. So there it was: a formula! No verbal or visual exposition, just an easily-missed bubble telling the kids what to do. You can't get any less "conceptual" than that. My daughters read the instructions and understood them, but they wanted to know why the formula worked. I asked them if the teacher had explained it, and they said he had not. I tried, unsuccessfully, to explain it. I then enlisted the help of my computer-scientist husband. He drew diagrams, and took my daughters, step-by-step, through the hows and whys of the formula given by the textbook; in doing so he was able to teach the girls how to carry out conversions from any metric unit squared to another—which the textbook formula, restricted as it was to conversions from metres squared to centimetres squared, was unable to do. My point here is neither to ridicule my daughters' math textbook nor to blame the school for choosing it; it is, after all, one of a handful of textbooks approved and financially supported by the provincial government. My purpose, rather, is to demonstrate that this so-called constructivist, "conceptual" textbook is neither. It's just poorly-presented, pedagogically dubious, bad math. Which is why I concur with my daughter: THIS MATH DEPRESSES ME. At the end of the Easter Term the maths master had very properly followed the call of the bugle, and the school had been compelled to employ a middle-aged temporary called "Wally" Wallace. 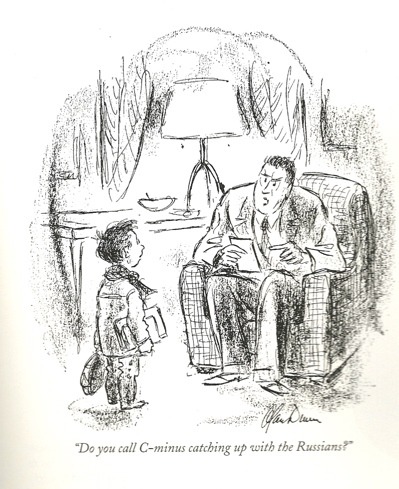 Although Wally knew little mathematics and less science, he was quite a plausible bluffer and had the wit to discover straight away which boys had some reputation at his subjects and then, as it were, to pace himself by them. If he were uncertain how to solve a problem, he would not flounder about trying to do it himself, he would set the whole class on to it and then announce that the school swot had come up with the correct answer. 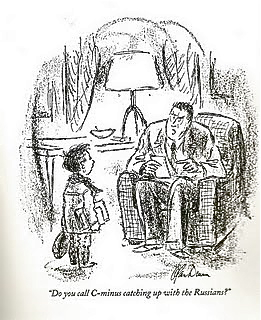 The school swot ("Lotty" Loder he was called) would then be invited to come up to the blackboard and demonstrate his solution to the accompaniment of grateful and approving nods from Wally ... who, however, was calamitously found out on the day when Lotty had been introduced by his neighbor to the delights of self-abuse. Wally by now had such trust in him that he summoned him to the blackboard without even bothering to look at his work; whereupon the wretched child came limping forward with a huge erection clearly visible under his grey shorts and no solution to propose to his audience. After a few feeble attempts at improvisation he asked to be allowed "to go to the bog, sir, please", stayed there exploring the full possibilities of his new-found hobby, and left Wally to do his own job for once. And a sad mess Wally made of it. So I'm still mulling over this "strikes" business, and the more I think about it, the madder I get, which is not a good sign. I checked with my daughter and she confirmed my suspicion that while it's possible for kids to get "strikes", there is no mechanism for a kid to get a "hit". In other words, here's a system where any mistake or slip-up a kid might make will be carefully tallied as a "strike", but if they perform well, there's no particular recognition of that. How is this anything but de-motivating? The teachers say they want to communicate with the parents, so why don't they listen to a single word we say? "You say you want to communicate with me, so we need to find a method of communication that works for both sides. Your proposed method, where you send my daughter home with a quiz that I'm supposed to sign, and then she forgets all about it, and then you tell her she's got a strike because she forgot to get my signature, is not a method that works for me. In fact, it offends me. It makes me angry. Therefore, that's not a useful method of communication between you and me." "If some parents like to communicate by signing the quiz, bully for them. They are welcome to do so. Make it optional and let every parent decide how they would like to communicate with you. You, the teacher, also have veto power. For instance, I might propose that I would like to communicate with you by calling you at home at 3:00 in the morning and screaming in your ear. If that method doesn't work for you, just say so, and we'll look for a mutually agreeable solution." Me: The point is, DD is a good kid, she tries her best, and I want school to be a positive experience for her. Mr. Q: Yes, she's a very good kid, school should be positive. Me: So it's discouraging for her that she's in there every day doing her best, and then she forgets one trivial little detail, and she gets a strike against her. Mr. Q: Oh, I wouldn't want her to feel discouraged or dejected or anything like that. I don't get it! Of course it's discouraging. What does he think? I was talking to another Mom about this and she said that at curriculum night, Mr. Q said: "all the kids will get a strike for something in the first trimester, so don't worry about it." He's got a hand-picked group of smart, well-behaved kids, and he goes out of his way to ensure that every one of them will receive a rebuke? What's the point? Why would you do this? Me (interrupting): DD doesn't know what "at bat" is! Mr. Q: Oh, well, I can talk to her about that. I don't think the strikes thing is about boys -- I tell the kids it's like baseball or softball. A couple of years ago I had 3 softball players in my class and they really liked it. We may have made a little progress at the very end. He said he wouldn't give up "three strikes", and I said that he could at least change it so that he didn't count getting a quiz signed as part of the assignment, just like doing actual math problems. I pointed out to him that DD has never forgotten to do the math problems, because she perceives them as important. She forgot to get me to sign a quiz because she perceives that as trivial paperwork, and she's absolutely right. I also told him that DD's opinion of him has gone down since she got a "strike", and he was genuinely surprised at this. I told him, "she can either feel bad about you, or feel bad about herself, and I'd rather have her feel bad about you." We just got back from seeing Race to Nowhere. Wow, what a powerful film. I recommend it to everyone reading this blog. Unlike almost everything else that you hear in the discussion about education, it asks the important questions, like "what are we doing to our kids?" I had a thrill of recognition when the film-maker described talking to school administrators about her depressed daughter, only for them to say, "She's fine! She's doing really well!" Been there, done that. There's a very sad discussion of a girl who committed suicide at 13, and it brings up a point I've wanted to discuss. Some kids commit suicide because of bullying by other kids, and this is a very serious problem that must be addressed. But there are also kids who commit suicide because of the pressure exerted by school, and this must be addressed too. Mr. Q -- DD mostly enjoys your class; she says it's the best math class she's had. The homework so far has been reasonable, so on the whole we feel that the class is going well. 1.) When you use baseball metaphors in class, you send a subconscious message that math is for boys. DD's a girl; she doesn't have any experience of baseball. In fact, I asked her about it today, and she wasn't sure what a "strike" in baseball even means. Suppose I was teaching a math class, and you were my student, and I was constantly using metaphors related to knitting. ("Hey! You dropped a stitch!") You'd feel that the class wasn't really meant for you, right? 2.) More importantly, I don't like to see DD scolded for completely trivial errors. I want school to be a positive experience for her. All she did was forget to ask me to sign her quiz. How does that warrant anything more than a simple reminder? The "strike" system is negative, punitive, and unnecessary. Why do it at all? Thank you for your consideration. -- FedUpMom. from The Complete Cartoons of the New Yorker. First published in 1958. Last night, OD got home from her soccer game (away) at close to 7:00. She was exhausted from a full day of school followed by sports. At this point she had already put in over a 10-hour day. She had dinner and relaxed a bit with her sister, and got started on homework at about 8:00. She had homework in 4 subjects: Math, Spanish, Science, and Social Studies. I would estimate the time needed for each of these assignments as follows: Math, 1/2 to 1 hour; Spanish, 1/2 to 1 hour; Science, well over an hour; and Social Studies, 1/2 to 1 hour. If she worked without a break, with maximal focus and efficiency (not likely because of her exhausted condition), she might have been able to finish it all in about 3 hours. As it was, she got through everything except the Science by about 11:00, at which point I sent her to the shower and started winding her down to bed. She didn't get to sleep until well after midnight. There are two issues with homework; quality and quantity. First, let's discuss quantity. Even if the quality of the homework was excellent, there was simply too much. OD is a 13-year-old child. I don't want school taking up every moment of her day, and wrecking her sleep at night. She needs time to call her own. She needs to have dinner with her family, hang out with her sister, and just plain relax in the evening. It's not reasonable to pile hours of work on top of a 10-hour day of school activities. Second, let's discuss quality. The quality of much of her homework is not high. Often, it seems like paperwork rather than actual learning. One of her assignments, writing an outline of a paper that she already read and highlighted, seemed especially ill-conceived, tedious, and burdensome. The physical act of writing the outline would take OD at least an hour. In conclusion, I would like all of you to look closely at the homework you assign. Is it reasonable? Is it useful? Is it necessary? Then, you need to communicate with each other and make allowances for sports teams so that you don't pile hours of work on a child who has only a few waking hours left in the day. We took OD out of the public schools in the first place because she was profoundly depressed on account of stress and overwork. I don't want her to go from the frying pan to the fire. There is a film showing tonight at the [local theater] at 7:00, called "The Race to Nowhere". If you have a chance, I hope you will see this movie. It's about the pressure that our kids face in school. And why is behavior so important? Angela Duckworth published ... a research paper that demonstrated a guiding principle of these charter schools: in many situations, attitude is just as important as ability. Duckworth studied 164 eighth-grade students in Philadelphia, tracking each child’s I.Q. as well as his or her score on a test that measured self-discipline and then correlating those two numbers with the student’s G.P.A. Surprisingly, she found that the self-discipline scores were a more accurate predictor of G.P.A. than the I.Q. scores by a factor of two. Oh yeah? I'm not surprised a bit. Grades are all about compliance. The compliant, conventional, average kid will outperform the unconventional genius every time. For a little balance, here's a rare critical article about KIPP, from the LA times: Long days, strict rules mark schools. I have long been suspicious of KIPP, or the "Knowledge is Power Program", a charter school company which is a darling of the mainstream media. KIPP mostly teaches low-income, minority kids. KIPP's motto is "Work Hard, Be Nice", and they ain't kiddin' about "Work Hard". KIPP schools have long hours (7:30 -- 5:00), and their students spend about 67% more time in class than most public school students. They are also given upwards of 2 hours of homework per night, and homework over "vacation". Famously, KIPP students are taught middle-class habits like sitting up straight and tracking the teacher with their eyes. As for "Be Nice", as a woman, I've had people telling me that all my life, and it's never done a bit of good. KIPP teachers are expected to help all students succeed, and they typically work a nine-hour work day during the week, half days on selected Saturdays, and three weeks in the summer. They also are available via cell phone for homework help in the evening. No one should expect teachers to martyr themselves for the good of their students. Teaching, like all jobs, should allow a reasonable balance between work and personal life. Actually, I accepted Kipp's invitation today, to come and look at a charter middle school. Four academic classes had a smartboard with a worksheet up on it. The board was smart, the content was dumb, the teachers were exhausted from leading the stereotyped clapping and response activities that accompanied the filling of the worksheet. "What is classification? How does classification help us?" There was nothing to classify, no student interaction, and the teacher was unable to get any kid to respond with the desired answer, so she couldn't fill in the dumb answers so the class could copy them. The kids, instead, made comments about whether a person in a coma or an unborn baby was alive. The teacher could only respond by critiquing their adherence to the behavior rituals. Apparently the lesson was "How do we classify is a living thing? ", and this was a science class. Only one worksheet was not agressively dumb, because there were actually a couple of styrofaom cups set up in the front of the room, with thermemeters in them. Students didn't move, or handle the cups, but that teacher alone was able to address the content of what children said in response to the worksheet questions. The other smart-board teachers were lost in the continuous struggle to maintain conformance with the bizarre clapping and posture rituals. This required continuous peppering of all discourse with monitoring, admonishments, threats to take away games, and little reward claps and games. The funniest reward games were Simon Says, and shooting a little Nerf gun at a target. The kids (all very cute ones) were okay with it, and seemed neither beaten down nor particularly educated. I can see how you'd be able to take some great still pictures. The teachers were a visible wreck, but then their principal had just strolled in with a guest at the end of a very long day of this. The kids were fresh as daisies, I have to say. They are indeed the lucky ones, and over half will win scholarships to the Catholic high schools, so they won't have to deal with MCAS. The unselected half will go to the public district, which is increasingly under the control of KIPP and other turnaround partners. Hmm ... reliance on clapping and posture rituals ... does this remind you of anything? Here's an interesting speech by Ken Robinson, plus animation! A Virginia fourth-grade textbook claims that thousands of black soldiers fought in the Civil War ... for the Confederacy! The book, written by historian hack Joy Masoff, says "Thousands of Southern blacks fought in the Confederate ranks, including two black battalions under the command of Stonewall Jackson." Masoff said one of her sources was Ervin Jordan, a University of Virginia historian. In an interview, Jordan denied being a source for Masoff's claims: "There's no way of knowing that there were thousands. And the claim about Jackson is totally false. I don't know where that came from." Apparently Masoff didn't even realize she had written something controversial. "It's just one sentence. I don't want to ruffle any feathers". She also describes herself as "a fairly respected writer." Not anymore you're not. On this blog, we've discussed two different classroom management programs, Whole Brain Teaching and Make Your Day. Both these systems are totalitarian, top-down, and punitive. In both cases, we've seen teachers who claim it's wonderful. For instance, District to Keep Make Your Day Program reports that a school board unanimously voted to retain "Make Your Day". In a survey, 95% of teachers agreed with the statement, "I find the Make Your Day program is fair and reasonable for students". The superintendent is quoted as saying that 90 percent staff approval is a good benchmark for the district. In the meantime, over 30% of parents disagreed with the statement that Make Your Day is fair and reasonable! As anyone who has tried to organize dissent against the school system can tell you, that's a very high percentage. But, the parents, as usual, were not listened to. The best they could get was a promise to "integrate positive feedback" into the program. Who is school for? It ought to be conducted for the good of the kids who attend, as overseen by their parents. Kids are mostly too young and impressionable to form their own judgements, and too completely intimidated (or profoundly depressed) to speak out. It is up to parents to keep watch and advocate for their kids. I've been thinking about the issue of bullying recently, having read too many stories of bullied children and young adults committing suicide. Some of the victims were gay, and some were perceived as outsiders for other reasons. Chris asks, "Why can't it be Better Now?" And northTOMom describes her efforts to teach tolerance to her children. No, I'm not bringing up any controversial political or moral issues. 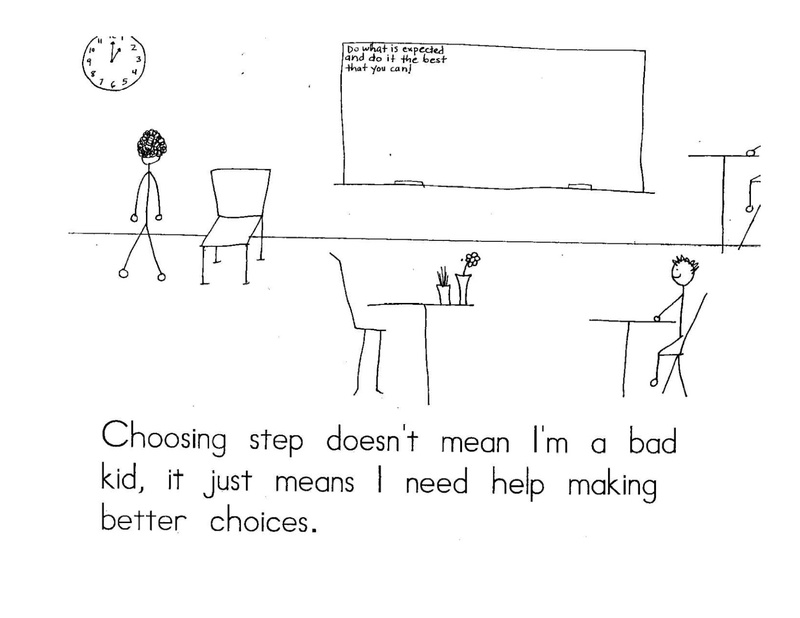 I'm talking about "choice" as the word is used by snake-oil classroom management peddlers today. Here's an example from the "Make Your Day" program, which I learned about on Suburban Chicken Farmer's blog, Bon Mot. (Thanks, SCF!) "Make Your Day" is the usual classroom-coercion model, featuring punitive "Steps" that are used if a kid gets out of line. For instance, in an atrocious list of kindergarten (!!!) steps, we see a child being punished for asking another child for a pencil when he should have been listening to the teacher. 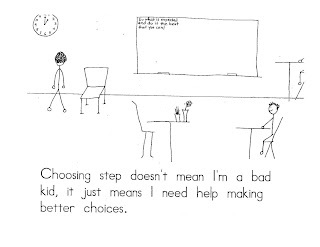 As we see the child progress from step 1 (sitting isolated in a special chair) to step 2 (isolation with his back to the class), we are told, "Choosing step doesn't mean I'm a bad kid, it just means I need help making better choices." As if it wasn't cruel enough to punish the child for a completely trivial offense, the "Make Your Day" folks proceed to mess with his mind. On some level the child knows perfectly well that he never "chose" to be punished, any more than he "chose" to be stuck in this godforsaken kindergarten class. But the teacher says he did, and his own parents might even sign a paper saying so. What does it all mean? It means that progressive ideas like respecting the child have gotten just far enough that a management system that openly used coercion and punishment would not sell well. But a system that uses coercion and punishment disguised as "choice" can sell very well indeed. Don’t know what the zone of proximal development is or how to identify it? Don’t know how to design an assessment rubric or how to differentiate instruction effectively? Haven’t got a clue how to grab the attention of an adolescent amygdala? Then you probably aren’t a teacher. On the other hand, if you recognize that chatter about "zone of proximal development", "differentiation", "rubrics", and misunderstood brain research is the sign of a clueless educrat, then you're probably a parent. Really, how did anyone manage to teach effectively before all this jargon was invented? So far, my child hasn't had many projects that were basically for us to do but when they increase I might have to lead a revolution. Either that or send her to school carrying a shoebox with her name on it, which is all she'd get to if I weren't working on it. First graders cannot construct Great Antarctic Explorers of Finland Perform the Comedies of Shakespeare in Drag out of elbow macaroni, tissue paper, and a glue stick. I have tested and confirmed this hypothesis. Some of you really do not get it! Projects are supposed to be done alongside a parent. It gives parents a chance to see what kids are doing at school and to asses their ability. Personally, I appreciate the time working with my child. When we do projects together I am just the "heavy lifter" We use my child's ideas and do a little brainstorming TOGETHER about the final product. I would not miss the opportunity to see my child research on the computer, get excited about learning and show them how excited and interested I am in their school work. Your enthusiasm and excitement fosters a life long learner and love of learning in your child. They will pick pick up on your negative attitudes and lazy work ethic too! Not only are parents (read "mothers") assumed to have the time, energy, and intention to do homework with (more accurately, "to") their kids, but we're told what attitudes we're allowed to have. Be enthusiastic! Model a good work ethic! Kids are perfectly capable of hating homework on their own, regardless of their mother's attitude. It's an imposition on their time, and they rightly resent it. The chirpiest Mom won't change their accurate perception that most homework is a pointless exercise in compliance. Guest post: Why can’t it be better now? Q: Why did you decide to create a YouTube channel to talk to gay teenagers? A: There was another suicide of a teenager, a kid who was being harassed for being gay. I put up a link to the story, and someone said in a comment that they wished they could have talked to the kid for five minutes to tell him it gets better. That’s always been my reaction too. I realized that with things like YouTube and social media, we can talk directly to these kids. We can make an end run around the schools that don’t protect them, from parents who want to keep gay kids isolated and churches that tell them that they are sinful or disordered. . . .
Q: The video advice you offer kids is to just hang in there. Why aren’t you telling them that you can help them now? A: We can’t help them. That’s what makes gay adults despair and feel so helpless when we hear these stories. We can’t barge into these schools. I get to go to colleges and speak, but high schools don’t bring me in, and those are the ages that young gay people are committing suicide. I’ve read these stories for years. Because of technology, we don’t need to wait for an invitation anymore to speak to these kids. We can speak to them directly. The project is admirable and moving, but there is also a layer of sadness over it. The best that it can promise these kids is that if they can just survive for four more years, their pain will subside and they’ll find some happiness. Until then, though, there is no prospect of relief. Intolerance and cruelty are almost universally seen as immutable features of childhood -- something to be endured, but not avoided. Is it true? How is it that, as almost everyone acknowledges, this cruelty largely dissipates the minute the kids set foot on a college campus? Is it because an extra year has utterly transformed their characters? Or is it because they suddenly find themselves in a very different kind of institution? The cruelty of kids is a form of dehumanization: the victim is treated as an object to be used, rather than as a full-fledged human being. You don’t have to look far, in K-12 schooling, for models of that kind of behavior. Much of the national debate about education is framed in exactly those terms: kids are a means to the goal of improving the gross national product and boosting our competitiveness in the global marketplace. Our job is not to engage them as partners in their own development, but to manipulate, trick, coerce, and punish them into doing what we think is best for us -- er, I mean, for them. We give them little or no say in how they are treated, and discourage them from thinking critically about the institution they are confined to. We give them no outlet for their grievances against those institutions. We reduce their civil liberties to a minimum. We insist that they be quiet and obedient. In short, we push them around a lot -- though we tell ourselves it’s for their own good -- and we can do it because they're powerless to stop us. Is that the recipe for getting kids to treat each other with respect and dignity? Guest post: Will homeschoolers save the schools? It seems like virtually everyone now knows at least one homeschooling family. Most people are still skeptical about the practice, but the mere existence of these families forces people to think, however briefly, about the possibility of doing things differently than they’ve been done in the past. I know that there are all kinds of arguments about homeschooling, pro and con, and that it’s impossible to see homeschooling as the solution to the challenge of educating a nation full of kids, since it’s just not an option for that many people. But I do wonder if the mere presence of homeschoolers will ultimately make people look differently at certain features of our educational system that we might otherwise just take for granted. Do homeschooled kids end up exactly the same as schooled kids? Probably not; otherwise there would be no point in doing it. They may be worse off in some respects, and better off in others. Presumably they’re different, but the more we see of them, the less it seems like there is anything disastrous in the difference. Are the outcomes perfect? No. Are the outcomes of conventional schools perfect? Hell, no. It’s hard to generalize about homeschooling because there are so many different approaches to it. But the more traditional “school-like” homeschoolers have more in common with the lefty/libertarian “unschoolers” than you might think at first glance. They all value the opportunity to treat the child as an individual, rather than as a face in the crowd; to take each child’s particular needs into account; to allow the child to progress at a rate that is appropriate for him or her, and not one that is dictated for everyone; to immerse the child in a wider world that is not artificially limited to other children of his or her own age group; to better model values that will enable the child to lead a fulfilling life; and to reach their educational goals more efficiently, with less of the child’s time wasted. In those respects, even a relatively authoritarian homeschooling environment is more humane and child-centered than an authoritarian conventional school. When people look across the street and see that their neighbor’s kids are somehow becoming functioning adults with only a fraction of the coercion and dehumanization that their own kids are experiencing in conventional schools, won’t they start to wonder what the added value of all that coercion and dehumanization is? Even if people remain skeptical of homeschooling itself, they may begin to look for ways to incorporate some of the positive aspects of homeschooling into their kids’ existing schools. In that way, homeschoolers may be doing conventional schools a favor in the same way that third parties have historically done the major parties a favor: the practice itself may remain marginal, but the existing institutions may be forced to address some of the underlying concerns that motivate it. One can hope, anyway. Louisa Durrell occasionally worried about young Gerald's schooling, and employed various tutors to transmit the basics, but she also gave her son enormous freedom to explore the island's wildlife. His years on Corfu launched his later career as a naturalist and writer. Gerald Durrell treats his mother as a comic figure in his books, but it's clear that she was an adventurous and unconventional spirit who gave her children a wonderful start on life. I've always admired those, like Durrell, who, rather than climbing up some prefabricated career ladder, invented their own career to suit their passions and abilities. In our times of rapid social change and economic uncertainty, more and more people will be called on to do this. How can a lockstep, authoritarian school system help our children find their own way in a constantly changing world? Richard D. Kahlenberg is proposing a solution to a problem that doesn’t really exist: the “legacy admission.” Rather than viewing the acceptance of a child to a parent’s alma mater as “affirmative action,” consider it the successful result of generations pursuing the American dream. For example, Granddad is the first in his family to go to college and gets a good job with a salary able to sustain a middle-class life. Then Dad gets into an “elite” college and gets a job with a salary able to sustain an upper-middle-class life, so Junior lives in the best school district in the state, has an SAT/ACT tutor, has time for music lessons, participates in sports and volunteers for community service rather than being forced into a part-time job to help pay grocery bills. Hence, Junior is a qualified and attractive applicant to Dad’s alma mater. Rich kids don’t get into the Ivies because their parents went to the Ivies. Rich kids get into the Ivies because their parents are rich and have provided these students with the opportunities to build résumés making them attractive applicants. The writer is a former undergraduate admissions officer for Brown University. The system works! Rich people buy resume-building activities for their kids, so the kids get into an exclusive college! Why would anyone have a problem with that? Well, I, for one, have a lot of problems with that. In 2007, the wealthiest 1% of the population of the USA took in 23.5% of the total national income (compare this to the late 1970s, when the wealthiest 1% took in 9% of the total national income). We have reached an extremely toxic overload of the rich getting richer, and the nation's elite colleges have become part of the cycle. P.S. The above figures come from Aftershock, the new book by Robert Reich. I'll have more to say about the book after I finish it. The NY Times today ran an article about the Manhattan Free School. Readers, would you send your kid(s) to a school like this? Why or why not? My answer is no. Now, it could be that the article was badly written (it wouldn't be the first time), but it's really not clear what the kids gain from attending this school. What do they know at the end of the year that they didn't know at the beginning? What experiences have they had? It could be a long year of nothing in particular. The Paper Bag Princess is a modern retelling of the old "damsel in distress gets rescued by handsome prince followed by marriage and happily ever after" fairy tale. In the Paper Bag version, the prince and princess are about to be married when a dragon shows up, burns up the princess' clothes so that she has to wear a paper bag (hence the title), and kidnaps the prince. The princess then tracks down the dragon, wears him out, and rescues the prince. The prince, though, complains that the princess doesn't look pretty any more. The princess tells him he's a jerk and they don't get married. This book is very popular among left-wing types, and I just noticed that it's listed in the handouts from my younger daughter's school. It was also presented as a play in the school. I don't like the Paper Bag Princess, and I don't think it's "empowering", as advertised, for several reasons. 1.) It's a parody of a fairy tale that most kids today haven't heard in the first place. We're not living in a culture that encourages young girls to think they'll be rescued by marriage, and we don't need to go out of our way to teach little girls that marriage doesn't mean "happily ever after". Our kids know that already. If their own parents haven't divorced, they've seen divorce in their friends' families. 2.) In a sense, the book is too true to modern life. The princess does everything a man can do; she outwits the dragon and rescues the prince. But at the end of the tale she has no marriage to show for it. This is sadly reminiscent of the choice many women today are faced with -- career or family? Pick one. That's not empowering, either. 3.) The story downplays the importance of marriage as a life choice. For most people, the decisions of whom, or whether, to marry, and when, or whether, or how, to bring children into the family, are enormously important, but, at least in the circles I move in, they are consistently disparaged in favor of "career" choices. When I was a kid, I was often asked what I wanted to be when I grew up. I knew that "mother" was not an approved choice. "Lawyer" would have been good, though. The underlying message is "don't even think about a happy marriage; it doesn't happen." The Paper Bag Princess reminds me of a project that used to be inflicted on kids in an attempt to discourage teen pregnancy. Kids would be given an egg, or a bag of flour, and told to look after it as if it was a baby. They had to cart it around wherever they went; if they had to leave it, they would need a "babysitter". If I recall correctly, the bag of flour might even be rigged with an alarm clock that would go off at unpredictable times. The underlying message here is "Babies ruin your life. Whatever you do, don't have one." Is this really what we want to tell our kids? They were very recently babies themselves. My younger daughter, aged 7, loves to speculate about whether she'll marry (currently she's against it because she thinks it would be disgusting to kiss a boy), and whether she'll have kids, and whether she should give birth or adopt (she herself was adopted.) I like having these discussions, and I'm quick to tell her that I look forward to being a grandmother. I'm not going to tell her, "don't have a baby until you're ready for that kind of responsibility!" Is anyone ever really ready for a baby? You become ready by having one. And I've never heard of a parent who says, "don't get a job until you're ready for that kind of responsibility!" We've got a culture that valorizes work and denigrates family, beginning at a very young age. It's time for a rethink.